Recoup Massage in Burke, Virgina offers Chair Massage, also known as Seated Massage, Corporate Massage or Trade Show Massage throughout Northern Virginia. 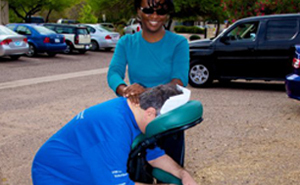 Chair massage can be performed in a wide variety of settings. Typically the person receiving the massage remains fully clothed, and sits fully clothed on a portable massage "chair" which allows them to relax comfortably and supports their body while they enjoy the treatment. A normal session can last anywhere from 5 minutes to half an hour or longer. This therapy can be a vital part of any corporate wellness program, as well as an excellent way to improve employee productivity, morale, and to reward their hard work.